It was just such an empowering statement. Really the whole series inspires me to be a little more badass, a little more confident, even stronger, etc. Be ferociously unapologetic when it comes to fighting for what I want in my life. This whole book was pretty inspiring and I did a lot of dog-earring. Lots of wisdom from a guy who is giving his "last lecture" because he knows he is going to die soon. If you love fantasy, you MUST read this trilogy from Melina Marchetta. I just loved this quote so much because WORDS WORDS WORDS. They are important. They are everything. Truth be told I could have done a whole top ten list just from this book. It's so inspiring and challenging and provoked something within me. This was one of those reminders I needed for sure. For YEARS, my dad has been convinced that one day I’ll be an author. And almost every time he’s brought it up, I’ve more or less paraphrased the above quotation. Just because I like reading books doesn’t mean I think I have any aptitude at all to write them (although the recent publication of crap like 50 Shades of Gray has made me want to try my hand at it, because if effing E. L. James can get three books published and made into movies, why can’t I???). I’ve never read Inkspell, but now I want to. This quote is so true; when I reread something, I always find myself remembering how I felt the last time I read it. It can be jarring, but it’s also kind of amazing how certain words in a certain order can bring back such solid memories, sometimes not even related to the book. I just love the optimism of this. Wonderful things happen! Sometimes we don't even know that it's happening right then. Other times... you just know. That moment of "wonderful" will stick with you forever. This made me even more determined to keep doing the things I love. Theatre. Put everything you have into what you love. It will start to affect everyone else. Ever listen to a song that someone put their heart and soul into? You can't help but FEEL that! Or looked at a painting. Or watched a performance. Their very essence becomes part of what they make. Tell us your favorite inspiring quotes from books!! Very cool quotes! Especially pleased to see Cornelia Funke up there. That's one of my favorite book quotes too. Totally experience that on rereading many stories. And that's so sweet about you and your husband, Kimberly. Kimberly, that's SO CUTE. You've just made me so happy :P Bridget, that's so annoying about your dad! It's a great quote. Jamie, I completely agree about Throne of Glass. Celaena is the perfect person to have in your inspiring quotes list. I totally haven't thought of The Last Lecture in forever! Also I almost put in that Rainbow Rowell quote form Attachments so clearly I love that one - Great list! I love The Last Lecture. I need to reread that one! Thanks for that and your other quotes! LOVE your quote from Inkheart! i chose a couple quotes from Inkheart as well! I don't think I've read any of these book but I love some of the quotes, especially the Finnikin and Inkspell ones. 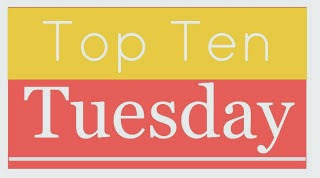 I am having so much fun reading all the quotes everyone picked -- this is the best Top 10 Tuesday prompt ever. Thank you! "Be ferociously unapologetic..." I like that. I like that a lot! Loved the Finnikin quote. How can you not? YES on the Oscar Wilde quote (I, too, have a Dorian Gray one). Just because we enjoy reading doesn't mean we'll become writers. That takes a special person. I haven't read Inkspell either, but I love that thought that read books are fatter because they contain memories. TRUTH. The Heir of Fire quote made my list and it's probably one of my favourite quotes ever. And I love The Lumatere Chronicles SO MUCH. I love Finnikan of the Rock! These are all great quotes! I really like your Dorian Grey quote, I didn't actually like the book but it's nice when that happens and you still find a gem in there. Great list! I love your Oscar Wilde quote; that's one of my favorite books too. Like you, everyone tells me I should write a book because I love to read so much. One does not lead to the other. Ooh, #3 makes me want to hurry up and read that -- not that I needed the excuse! I love the Oscar Wilde quote. Brilliant and so true.